Issue XIV Vol. 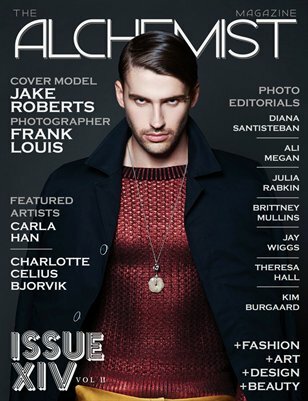 II of The Alchemist Magazine features model Jake Roberts on the cover photographed by Frank Louis. The issue also features photography editorials by: Diana Santisteban, Ali Megan, Julia Rabkin, Brittney Mullins, Jay Wiggs, Theresa Hall and Kim Burgaard. Featured Artists: Carla Han and Charlotte Celius Bjørvik.